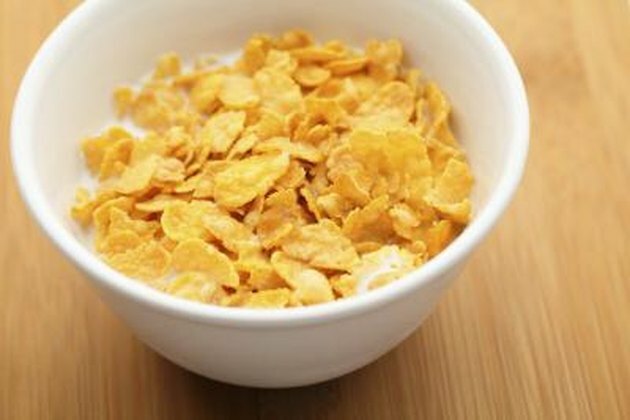 Developed in the late 1800s, cornflakes became the first commercially available ready-to-eat breakfast cereal in 1906. Popular brands of cornflakes are typically prepared from milled corn, malt flavoring and sugar and contain added vitamins and minerals. While still a familiar breakfast item, cornflakes can also be crushed and used as a substitute for breadcrumbs or as a topping for casseroles or pasta dishes. According to the U.S. Department of Agriculture, a 1-cup serving of dry cornflakes contains 100 calories. None of these calories is contributed by fat: Cornflakes contain no fat or saturated fat. They are also cholesterol-free. A cup of cornflakes topped with 1/2 cup of skim milk can serve as a quick breakfast or snack on a low-fat, calorie-controlled diet. Each cup of cornflakes contains 24 grams of carbohydrates, with 1 gram contributed by dietary fiber and 2 grams of simple sugars. Adult men between 19 and 30 years old should have 34 grams of fiber each day, while women of the same ages need about 28 grams. For these individuals, a cup of cornflakes would fulfill 2.6 percent of a man's fiber requirement and 3.5 percent of a woman's. Older men and women require less fiber per day, and a cup of cornflakes fulfills slightly more of their daily fiber requirement. The Centers for Disease Control and Prevention advises that a man should have 56 grams of protein each day and that a woman should have 46 grams. Cornflakes contain 2 grams of protein in every cup. This amount fulfills 3.5 percent of a man's daily protein needs and 4.3 percent of the requirement for a woman. Cornflakes are enriched with B vitamins that were lost during the manufacturing process and fortified with additional vitamins not normally present in corn, including vitamin D and vitamin B-12. The amounts of particular vitamins in a serving of cornflakes can vary widely. Some commercial brands contain 10 percent to 15 percent or more of the recommended dietary allowance, or RDA, of vitamins A, C or D for an adult on a 2,000-calorie diet and over 20 percent of the RDA of thiamin, folic acid, vitamin B-12, niacin, riboflavin and vitamin B-6. Cornflakes are fortified with iron, though you need to check the nutrition label to determine how much is in a particular brand. Brands that contain 8 milligrams of iron in a 1-cup serving provide 100 percent of a man's daily requirement of iron and 44 percent of the amount of iron a woman should have each day. Cornflakes typically contain around 45 milligrams of potassium per cup, or about 1 percent of an adult's RDA for potassium.